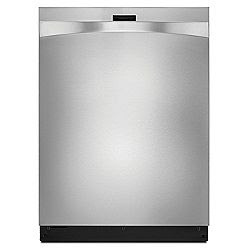 This week we're looking at the Kenmore Elite dishwasher model 1397X. The Kenmore Elite 1397X - available in white (13972), black (13979), and stainless steel (13973) - is one of the quietest and most advanced dishwashers available. The exterior sports the Kenmore Elite design, with a flared towelbar handle and clean lines. There is no logo on the front, and the controls are fully integrated, which creates a seamless and unbroken plane across the entire door. The display at the top-center shows where in the cycle it is, whether the delay has been selected, and whether the dishes have been sanitized. At 43 decibels, the Kenmore Elite 1397X is relatively silent based on normal household noises. 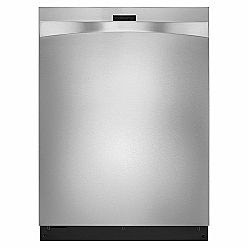 Whether it's installed under wall-mounted counters or in an island setting, this dishwasher should not interfere with conversation, hearing the television/radio, or just enjoying a quiet moment. Its triple filtration system ensures that only clean water passes back through the pump to the wash arms. The upper wash-arm has the UltraWashHE design, using slits and smaller circular openings to increase coverage and pressure without using more water or energy. The lower wash-arm uses the PowerWash360 system, which eliminates dead space in the bottom rack so everywhere gets equally clean. The stainless steel interior is nice to look at, but also serves to improve drying, durability, and sound insulation. With a recessed heating element, the water gets hotter faster, which means less energy spent heating water for the wash and sanitizing rinse cycles. A feature on the Kenmore Elite 1397X that is probably unfamiliar to most people is SmartDry. This is a new system that uses a fan to improve drying performance. If you choose the SmartDry option, a sensor will determine whether the fan should be used in conjunction with the heated drying. Dryer dishes and fewer spots on glasses means your dishes look good the first time around. No extra rinsing or wiping. Cycles are simple to choose. For most loads, "SmartWashHE" is all that is needed. But, for those times when you want more control over what the dishwasher does, you do have easy options available. Choose the Eco cycle for reduced energy use. 1 Hour Wash will follow through with its promise, but at the cost of increased water and energy consumption. Pots and Pans is a more vigorous and hotter cleaning cycle which should be reserved for...you guessed it...pots and pans. The China Gentle cycle is for special dishes and more delicate materials that do better with lower pressure, lower temperature washing. Normal is for an average load of average dishes of average messiness. As with all dishwashers, you should use the High Temp option to heat the wash water, and use Smart Dry to ensure optimal drying and spot prevention. Use a good automatic dishwasher detergent (I highly recommend Finish PowerBall Quantum) and, if not already in the detergent, a rinse aid (such as Finish Jet Dry Rinse Agent). And, finally, it's a Kenmore Elite, part of America's favorite appliance brand (Kenmore). With the largest variety of Energy Star-rated appliances (including ALL Kenmore Elite dishwashers) and a proven track record of innovation and reliability, the Kenmore Elite 1397X is the new gold standard for dishwashers. Quiet, efficient, powerful...Kenmore Elite. Now that's genius. The sister model of the Kenmore Elite 1397X is the Kenmore Elite 1396X, which has all the same features as the 1397X, with the exception of the SmartDry fan-assisted drying system and rates 46 decibels versus the 43 decibels of the 1397X. There is about a $100 difference in regular price between the two. Remember that you'll need a dishwasher installation kit to hook up your new dishwasher!